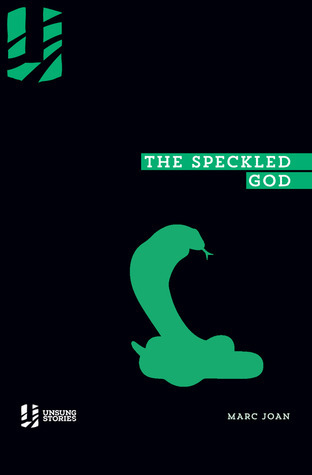 The Speckled God is a rare book; a novel which, despite the straightforward nature of its plot, manages to excel by taking us, the readers, to entirely new and unexplored realms. What readers know in literature today as “horror” has many roots, not least of which was the gothic fiction of the nineteenth century. Gothic fiction’s hallmarks were a gormless and unsuspecting protagonist, a devilish villain, a remote rural location, and a lot of hand-wringing and despair in the narrative. The purpleness of the prose was left to the whims of the individual author. As the genre matured it began to specialise, and many authors began adopting the conventions of the gothic form to new locations. Gone were the dreary tumbledown castles of Europe, replaced with the eerie backwoods of New England or the steamy swamps of the Louisiana Bayou. This has proven the form can be transplanted, and it’s a wonder that it hasn’t been transplanted further. In The Speckled God, Marc Joan does just this. In doing so he not only serves us a literary surprise but also takes us on a journey to a new land. In western literature books about post-colonial India are rare, and stories about India during partition are even rarer. This adds to the strangeness of the story but also adds a rod for the author’s back—forcing him to introduce us to the new setting while drawing us into the narrative. Joan does this extremely well. The story begins in the early 1970s with Joki de Souza, a minor functionary in a tea company, as he discovers an irregularity in the accounts of one of the company’s plantations in the south. A city dweller himself, he decides to travel far into the rural south to the plantation to investigate. When he arrives in the land of the Tamils he is drawn into a plot of intrigue, superstition and, ultimately, blood. On the surface it would be easy to look at the elements of superstition in the book as a Kiplingesque western retelling of sub-continental mysticism. But this is no Indiana Jones—no sensationalistic priests tear people’s hearts out while screaming to Kali. Instead the mystical elements are added sympathetically and slowly, not patronisingly. Everything serves the story of the speckled god, the cult of Mother Jakkamma. The reader will find no cultural stereotypes here, and Joan is to be congratulated for exploring his world in such a fashion. The story is told in true gothic tradition, with a mixture of conventional narrative and post-reporting. This is confusing—we are told early in the story that Joki has disappeared, but at times within the story we see things and hear conversations no one could possibly report later. Joan refrains from reporting Joki’s internal dialogue at least, but this itself lends Joki an unrealistic air, as if we never truly know him. He remains distant to us, a tragic figure caught up in events beyond his control, rather than a sympathetic figure we may empathise with. It is hard to judge if this was intentional on the part of the author but is certainly at odds with the gothic nature of the story. Traditionally readers in the genre end up knowing far more about the protagonists than they may be comfortable with. Yet it works, adding to the “found document” reality of the story, so the readers find themselves sympathising more with Joki’s investigating friends than with him. The story is strong and carries readers along at a good pace. The tension slowly ramps as readers find themselves immersed in the heat and humidity of a southern Indian summer.